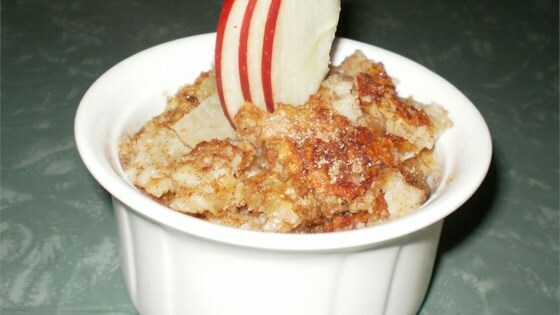 "Delicious Passover specialty that's easy and can be served with either meat or dairy dinners! Can also be made ahead and cooked later." Preheat the oven to 350 degrees F (175 degrees C). Place the crumbled matzos in a medium bowl, and add enough water to cover. Let stand for 2 minutes, then drain off excess water. Do not squeeze. To the bowl of matzo, add eggs, 1/4 cup sugar, salt, lemon juice and applesauce. Stir to combine. Mix in the apples and dried cranberries. Spread the mixture evenly into a 2 quart casserole dish. Mix together the remaining 1/4 cup of sugar, and cinnamon; sprinkle over the top. Bake for 45 minutes in the preheated oven, or until the top is golden, and the apples are soft. Tastey & easy. Instructions didn't say to grease the pan, so it stuck. Next time I'll know better. I tried this recipe for our Passover Seder and it was delicious! Everyone at the table loved it. It was easy to make and very tasty. Very good, especially for a Passover recipe. Used 2 very large apples and raisins instead of cranberries.